Vientiane (VNA) – The media of Laos on June 13-14 gave over a lot of space to highlight the three-day visit of President Tran Dai Quang to the country, the first made by the Vietnamese State leader since taking office. 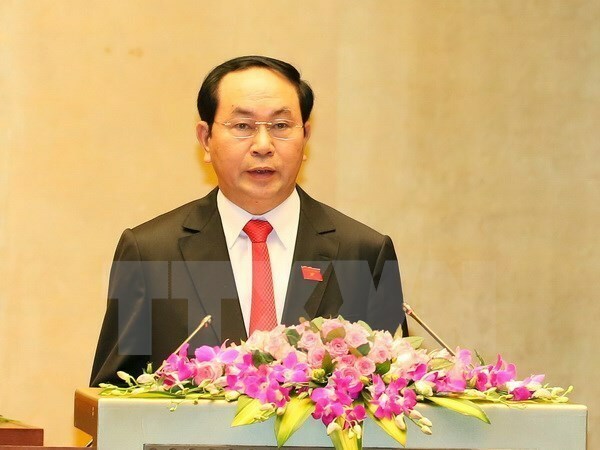 The Lao press pointed out that President Tran Dai Quang’s selection of Laos as his first destination has shown Vietnam’s wish to further strengthen and deepen the traditional friendship, special solidarity and comprehensive cooperation between the two countries’ Parties, Governments and people. Major local media agencies, including the Paxaxon, Vientiane Times, KPL News, PathetLao, LaoPhatthana, Vientiane Mai, and Setthakit Kankha, highlighted the outcomes of talks between the Vietnamese President and Lao Party General Secretary and President Bounnhang Volachith, reporting that the talks took place in a friendly, honest and trustful atmosphere and in the spirit of comradeship and brotherhood. During the talks, the two sides expressed their delight at the growing special relationship between the two countries and their people. They affirmed that they will give the highest priority and try their best to further the bilateral traditional friendship and special solidarity. They agreed to continue increasing high-level delegation exchanges and meetings, effectively implementing bilateral cooperation mechanisms, reinforcing political trust, and enhancing collaboration in the fields of politics-diplomacy, defence-security, economy, trade and investment. Particularly, the two sides confirmed they would coordinate closely in fostering ASEAN solidarity and in enhancing the central role of the grouping in regional security architecture, while stressing the importance of maintaining peace, stability, security and safety in the East Sea.